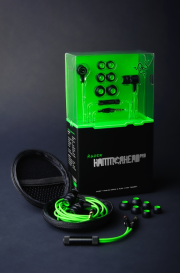 CARLSBAD, Calif. – Razer™, the world leader in high-performance gaming hardware, software and systems, announced the launch of the Razer Hammerhead series of in-ear headsets, two all-new audio solutions for mobile gaming and music. The Razer Hammerhead in-ear headsets offer incredible durability and fantastic audio quality from their 9 mm neodymium drivers, making them excellent choices for music listening on the go. The headsets come in two versions – the Razer Hammerhead and the Razer Hammerhead Pro, with the latter sporting an omni-directional microphone with an in-line remote for phone-call control, perfect for convenient voice communication. Both in-ear headsets are machined out of aircraft-grade aluminum, promising extreme durability, while maintaining a lightweight and comfortable form factor. With a matte, brushed surface finish, these in-ear monitors look as good as they sound. With interchangeable ear-tips included in three sizes and optional bi-flange attachments, the Razer Hammerhead in-ear headsets offer ultimate sound isolation. The inner acoustics chambers of the Razer Hammerhead in-ear headsets feature a sonically optimized design to increase aural resonance. Paired with high-performance, precision-tuned, 9 mm neodymium drivers, the headsets produce a sound signature packing strong bass while maintaining crystal clear mid-levels and highs. The Razer Hammerhead Pro In-Ear Headset is an in-ear monitor (IEM) engineered from the ground up to set the standard in portable gaming audio. Machined out of aircraft grade aluminum, the Razer Hammerhead Pro embodies ultimate durability packaged in a lightweight, comfortable form factor. Encased within each sleek, brushed shell is a high performance, precision-tuned 9mm neodymium driver. Paired with an optimized inner acoustics chamber in each shell, these in-ear monitors produce a sound signature that packs a mean, earth-shattering bass while maintaining crystal clear mids and highs. The Razer Hammerhead Pro comes through with a full-bodied low-end frequency, pounding in the beats without distortion. Supreme quality sound would be wasted if drowned out by stray, ambient noises. That is why the Razer Hammerhead Pro comes equipped with interchangeable ear-tips in 3 sizes, along with an optional pair of bi-flanges to provide superior sound isolation and bass response. This exceptional audio solution also features an in-line omnidirectional microphone with one-touch phone call control for crystal-clear, convenient voice communication with mobile devices on the go. Topped off with a compact carrying case for portability, the Razer Hammerhead Pro epitomizes the way in-ear monitors should be experienced – with style, comfort and aural fidelity. 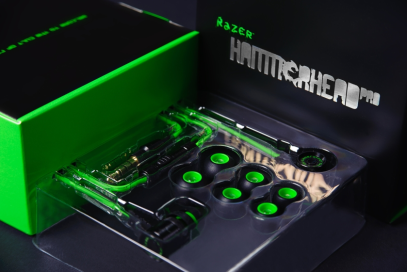 For more information about the Razer Hammerhead Pro Analog Gaming & Music In-Ear Headset please visit www.razerzone.com/hammerhead. Also available are the Razer Hammerhead Analog Gaming & Music In-Ear Headphones for those who do not require voice communications with the IEMs.